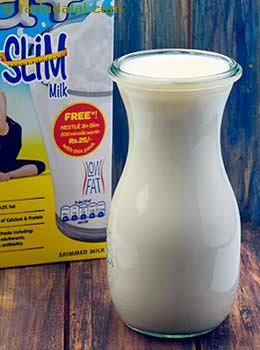 Low fat milk simply put is milk, minus the creamy fat that it regularly comes with. Technically that process is called centrifugation. Not to be confused with skimmed milk, low fat has 1% to 2% of fat as opposed to skimmed, which has less than 0.5% fat. The cream left behind after centrifugation is later used to make cream, butter and other dairy products. The only minimal difference between regular full fat milk and low fat is the taste and consistency. The glycemic index of low fat milk is 32 and the glycemic load is 3.2. Is low fat milk safe for diabetics? The glycemic load of 1 cup of low fat milk is 3.2 due to its low carbohydrate content. Drinking 1 cup of low fat milk won’t raise your blood sugar levels instantly. Always remember to have your milk also in moderation even though it is low in fats. This because there are still carbohydrates present in the low fat milk. It is very crucial to keep a check on the amount of carbohydrates consumed per meal so let the blood glucose levels remain stable. Combine your low fat milk with any whole grain cereal and have it as a porridge. Such meals will keep you at better pace and you will feel satiated for a longer period of time. Calcium in low fat milk helps in improving insulin sensitivity. Also low fat milk is extremely a rich source of vitamin A that helps in improving your vision. Is low fat milk suitable for weight loss? 1 cup (approx. 200 grams) of low fat milk provides around 70 calories with 7 grams of protein. This makes low fat milk healthy for the weight watchers as it contains negligible amount of fats. The protein content in low fat milk consist of all the essential amino acids which your body requires for proper functioning. Thus it is a high biological value complete protein. It also contributes in satiety, boost your metabolism and maintain your lean muscle mass. Low fat milk is an extremely rich source of calcium providing around 300 mg for 1 cup. Calcium effectively helps in reducing fat by increasing the energy expenditure.